my salad for the day. Challenge Forum: my salad for the day. Sometimes life is THAT simple. Keep in mind that vitamin C will be broken down by oxigen. So fruits and vegetables that you want to store for longer then an hour must be "whole to eat" foods or roughly cut. I also always look in the baby-department for handy food-containers. Those moms nowadays do know how to bring along their baby's nutricients, but they can be superhandy to bring along the ingredients for your on-the-road salads!! Excellent organisation, puhpine. I love the snack containers too. 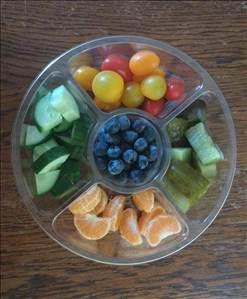 My daughter (who is now almost 13) loves to take crackers, yoghurt and cut veg or fruits to school in the mini containers. That is easy, good fast food.